1. Yvonni-Effrosyni Damianidou: “Direct Laser Metal Deposition of Ti Matrix Composites and Analysis of Microstructure and Mechanical Properties”. 2. Vassilios Priftis: “Experimental Study of Resistance Components on a Sailing Boat”. 3. Michael Pytharoulis: “Parametric Modeling of Cargo and Ballast Tanks and the Corresponding Piping Systems Using AUTODESK INVENTOR”. The theses were judged by a four SNAME members ( two executive committee and two faculty members ) and were graded on the basis of: Value & Usefulness of Topic ( 20% ); Quality of Thesis Work & Undertaken Research (50%)and Quality of Presentation (30% ). The winning thesis was no. 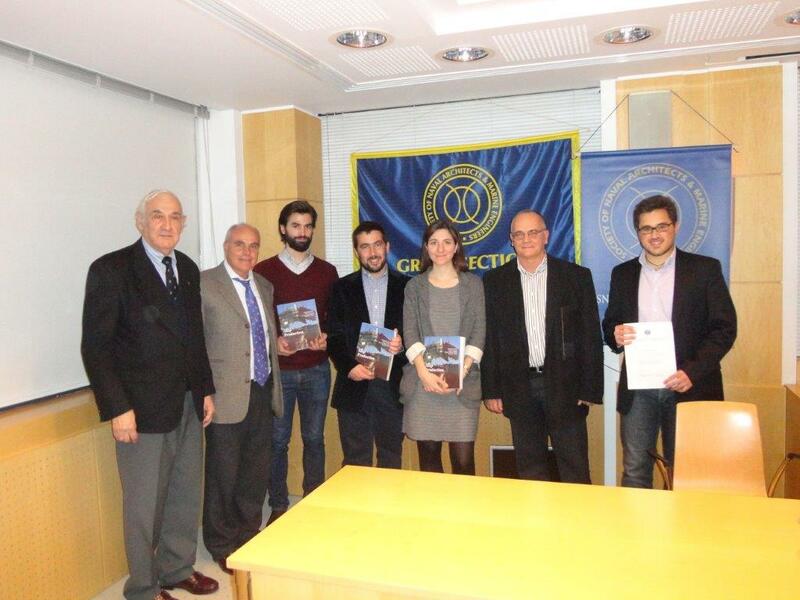 3 by Michael Pytharoulis, from the Division of Ship Design and its supervisor was Prof. Apostolos Papanikolaou. All four theses were of excellent quality and received high grades. The winner received from the Greek Section a 300 euro cash gift, while the other three received a copy each of the valuable, 420 page SNAME textbook “Ship Production”. All power point presentations can be accessed in the link below. Following the presentations the traditional vassilopita cake for the new year was cut by the Chairman of the Greek Section Prof. Apostolos Papanikolaou. The winner of the lucky coin was Prof. Dimitris Pandelis of NTUA, who received a silver plated envelope opener with the SNAME logo. Then in the adjacent hall a reception took place, where the competition results were announced and the gifts given out. ( from left to right ): P. Lalangas, Secretary / Treasurer; N. Dionissopoulos, Exec. Com. member; G. Spanos, competing student; V. Priftis, competing student; Y. Damianidou, competing student; A. Papanikolaou, Chairman; M. Pytharoulis, winning student, holding the winner's certificate. 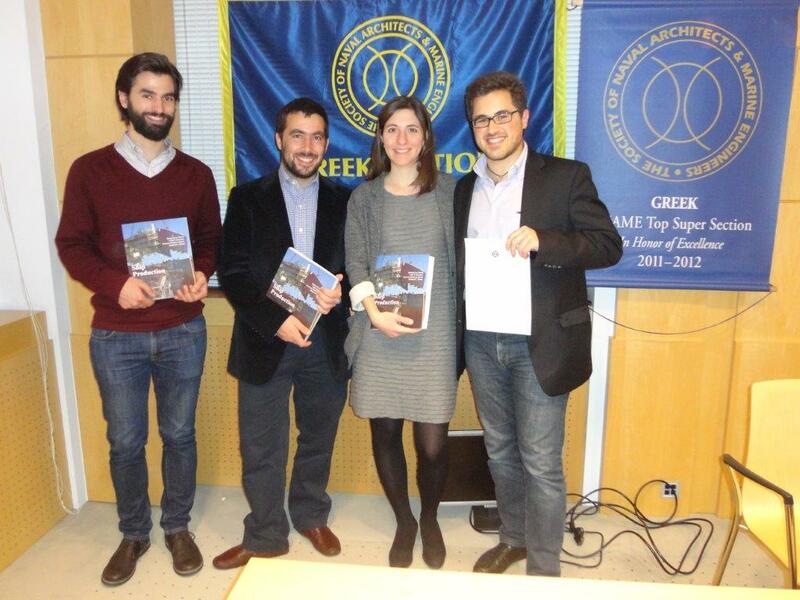 The other students are holding the SNAME textbook " Ship Production " a gift from the Greek Section.